Well, OK, so, this was another of my ‘two lunches in one day’ events. We arrived at around 2.30pm to relative tranquillity and no queues. 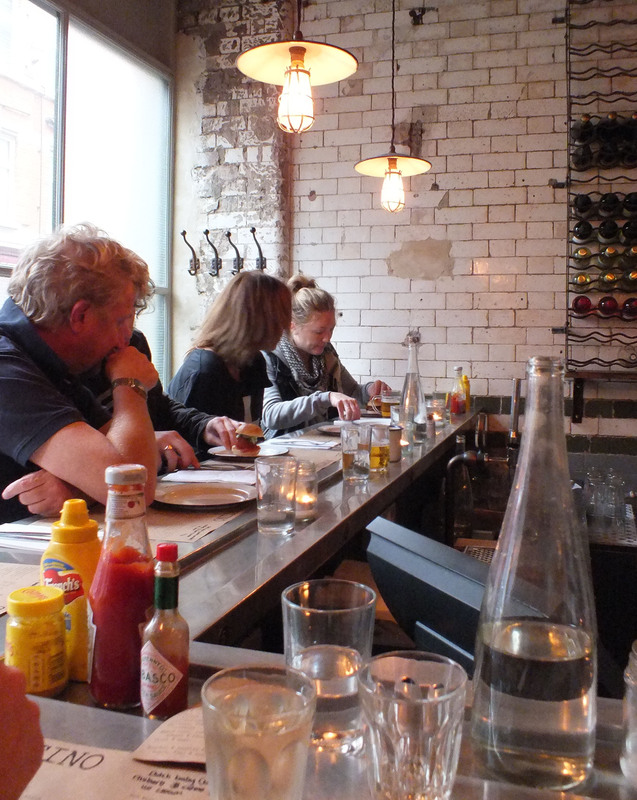 And, we sat at the bar, with the little trough that holds water glasses and condiments and ordered the predictable but must be tried slider, skinny fries and truffled egg toast. I’m still alive and I kind of liked it. I went into Spuntino’s expecting street cool detachment and had visions of being thrown out for lack of appropriate hip clothing. The reality was a cosy bar with friendly staff and enough other punters not to make it feel dead. The food was really pretty good too. I could smell the truffle on the truffled egg toast, and if I happened to LIKE egg, then this rather gooey mess of egg, cheese and sliced bread seasoned with truffle would have been perfect for a wet spring day. Instead, I found space for a tiny but perfectly formed beef and bone marrow slider and a large bowl of curly potato fries. The bill for our afternoon snack, with two small glasses of wine was around £25. Really not bad for playing at being cool for an hour or so and escaping the persistent rain into a warm and friendly atmosphere. I’d probably avoid the place any time there was a queue (the bar staff said they served popcorn to patient punters from around 5.30pm onward). But that’s just me. If you want to be cool these days, you queue and enjoy. I’m getting to quite like Russell Norman’s restaurants, it’s like being part of a Woody Allen script without the angst and stage-fright. 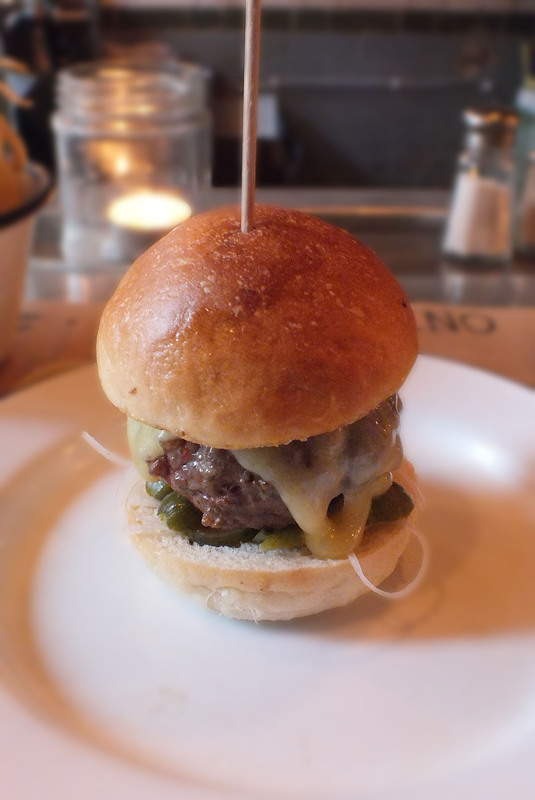 Just came across London Unattached while researching Spuntino as I’m keen to try it out on the weekend. The blog is great! I’ll be revisiting for more London foodie inspiration. Thank you! oooh that sounds like a great place. 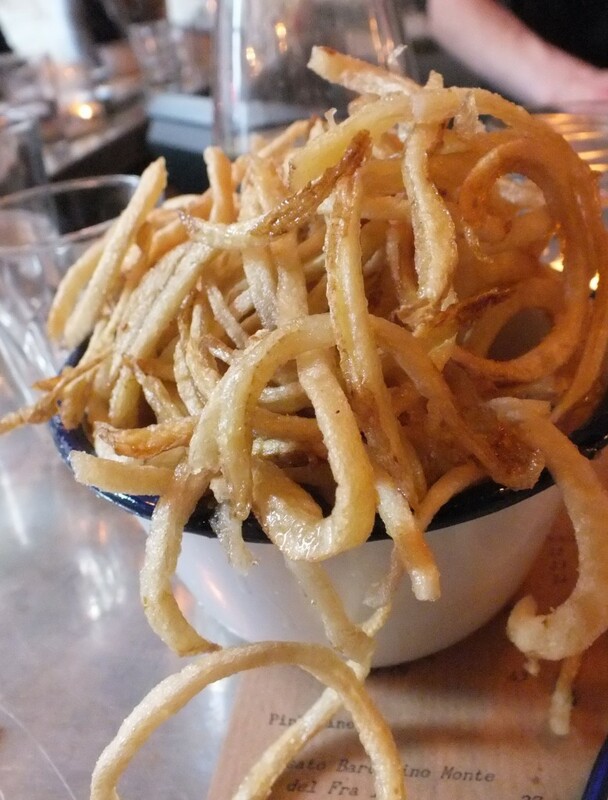 The fries look fabulously moreish…! 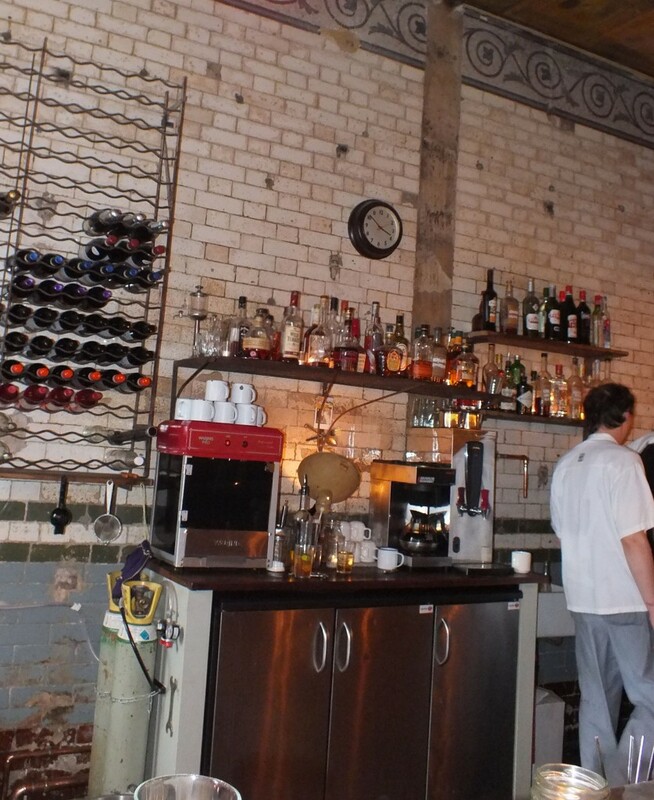 I’m a bit of a Russell Norman convert, I was really cynical – mostly because the bars and restaurants he runs are SO hyped and ‘PR-Street-Cool’. But, they work. 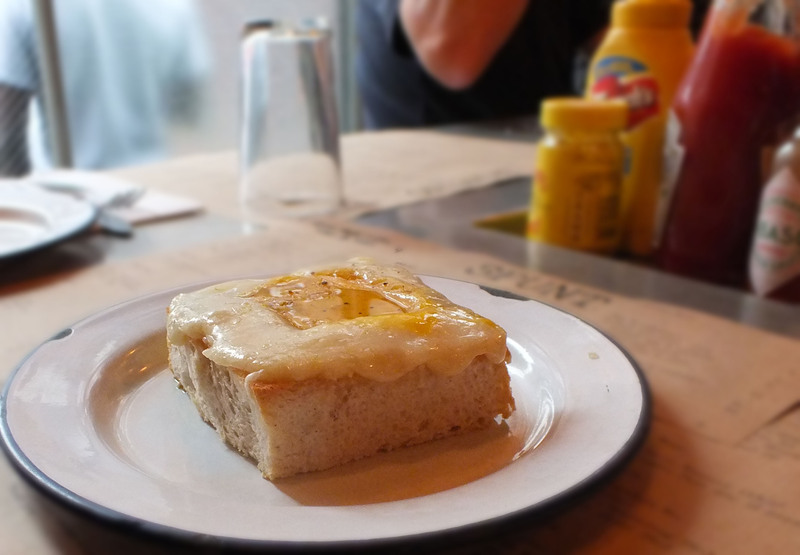 I wish I liked egg and could have eaten the truffled egg toast because it smelt divine! You are going to be too cool to speak to the likes of me soon – ha ha! Not sure about the fries, they looked a bit underdone for my liking and the toast wasn’t very appetising even though I like the ingredients. The ‘slider’ was cute but £25, I’m just not cool enough! lol, the fries were lovely, they were cooked with skin on which is partly why they are a bit ‘grey’. I don’t think it was overpriced – the slider was £5, the truffled egg toast £6 but we had a couple of glasses of wine and the bill included service. I would hate to queue, but then I HATE queues!